When was the last time you had your brakes inspected, repaired, or replaced? Good brakes are a necessity! 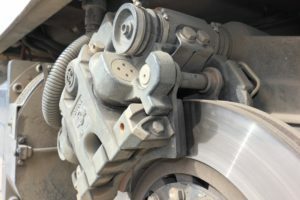 From the brake pedal to the hydraulic brake fluid, from your brake’s master cylinder to to it’s power brake booster, from drum brakes to disc brakes, and electronic anti-lock brake sensors, the expert technicians at JK Automotive know every part of your car’s brake system and will perform brake repair on any make and model of vehicle. Don’t get caught with no brakes when you need them! You hear a grinding, rubbing, or a constant squealing noise when braking. Any time you notice these kinds of symptoms, it’s always a good idea to come in and have your brakes checked by one of our certified technicians. If our inspection reveals you do need brake repair or replacement, then we’ll fully explain exactly what your options are, what’s required, and provide you with an estimate of what the costs will be before any work gets going. Call today and schedule a brake inspection. P.S. If you want to know more about how your tires and brakes work together to keep you safe in your car, see our article What You Need to Know About Your Cars Tires & Brakes.